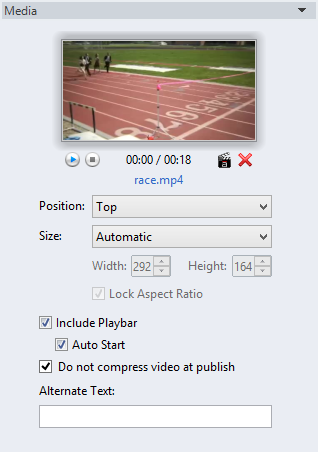 Replacing a Video: Click the blue hyperlinked text to choose a different video file or to modify the embed code for a website video. Click the red X if you'd prefer to completely remove the video. Position: Choose where you want the video to display in your published interaction. Alternate Text: Enter text that describes the video, and screen readers will read it to your learners.